In the summer of 2015, the Japan Automobile Federation (JAF) introduced Auto Test, a motorsport loosely based on the UK motorsport of the same name. JAF bills the races as an, “informal motorsport experience,” and only requires a driver’s license to participate. No other safety gear such as helmets gloves, or racing shoes are required and participants may dress casually in short sleeve shirts and shorts. Drivers may also share and borrow vehicles and have up to one passenger on board (6 years old or older and at least 140 cm tall) as they race through the course. Participants are encouraged to bring their daily drivers for the races, and in the past, there have been full size SUV’s and micro busses as well as sportier models such as the Subaru Impreza WRX. The events are also advertised as an easy way to obtain a domestic class B competition license. The Auto Test course itself is inspired by city driving, must take place in an area no larger than 200 meters by 200 meters and there are between 1 and 4 sections where the driver must use the reverse gear. Other sections test skills as stopping your vehicle within a designated area and a slalom section where the driver must weave through a set of cones. There must also be a turn within 50 meters of the starting point and the courses are designed so that the maximum speed does not exceed 50 km/h (32 mph) at any time. The layout, which is released in advance of the race, is also made in a way so that it is easy to memorize in order to reduce course outage. In order to increase accessibility, prices are kept low ($5 / 500 Yen) and walk on registrations are allowed depending on location. At the race, every participant gets 3 “laps”, one practice and two timed. 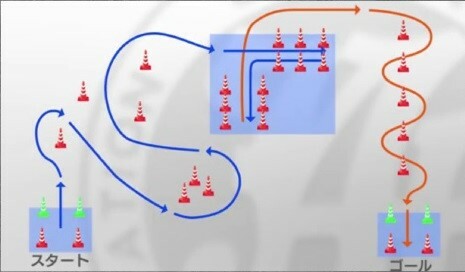 As with most auto races, the time from start to finish is measured but there are also time penalties for false starts, leaving the course and for hitting cones which are added to the course completion time to determine the winner. Each event can decide its own classes but previously, there have been classes based on gender, engine sizes, transmission type, and if the vehicle is a rental or not. The original British version of Auto Test has a history going back at least 50 years and there are over 1000 events a year with drivers often bringing highly modified specialized vehicles to the races. The original Auto Test is often a first step into more serious motorsports racing. For the Japanese events, JAF’s goal is to improve driver safety and to expose and introduce people to motorsports who are typically not interested. It will be interesting to see what JAF will do to keep the Japanese Auto Test diverse, accessible and casual. Japan Car Direct sources Japanese vehicles from dealer auctions and used car lots from all around Japan. Please contact us for all of your JDM import needs!